This species is widely distributed and found throughout the Mississippi River system, with exception of extreme southern and western reaches. It also occurs in the St. Lawrence River basin and tributaries of Lakes Erie, Michigan, and Ontario and is considered stable throughout much of its range. 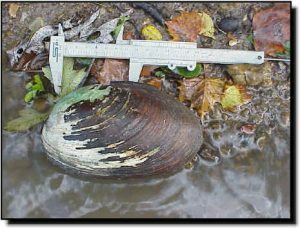 Comments: The mucket is a smooth, non-descript mussel and one of the rarest in Kansas. The large, heavy specimens found here appear to be old and well-worn. This would indicate very little reproduction has occurred in the last few decades. The shells are typically yellowish-brown with wide, greenish rays. There are numerous fish hosts known for the mucket. The female mucket usually releases her glochidia in June. 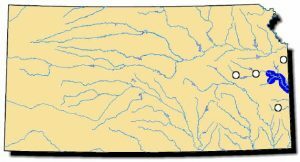 In Kansas, it only occurs in the lower Marais des Cygnes River. East of Kansas, this species is described as common to abundant.